A HENDON DEBUTANT: The Armstrong Whitworth Whitley heavy bomber is likely to make its first public appearance at the R.A.F. Display on June 27. Its engines are two 790/880 Tiger IXs. SLEEPER TRANSPORT: The interior accomodation of (left) the Douglas Sleeper Transport and (right) the D.C.3., which is the daytime flying version. Sixteen passengers are carried in the D.S.T., with four bunks in each of four compartments. At the rear are two furnished dressing-rooms, while aft of the control cabin is a steward's galley. 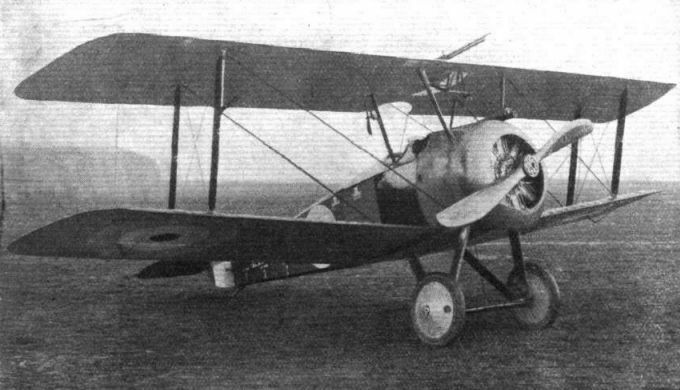 "The Camel of 1917 ... possessed extreme manoeuvrability"
As used by the Swedes and (incidentally) Persians: The Pegasus Hart which, with the Osprey, is in production under licence for the Royal Swedish Air Force. 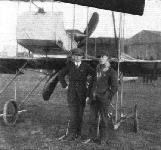 Looking back : A photograph of the Brothers Pashley, taken at the old Shoreham aerodrome, which appeared in Flight early in 1914. 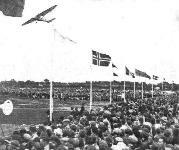 The aerodrome was actually opened in 1910. MODERN TRAINING: These four Hawk Trainers, which have been specially designed for aerobatics and inverted flying, were delivered by air last week to the Roumanian Government. These are the first British low-wing trainers to be sold abroad. NOT A SILENCER, but the smoke-box under one of the two Hawk Majors which Major J. C. Savage added to his sky-writing fleet a year ago, and which have given good service. The smoke-producing chemical is fed to the box from a supply tank, and the engine exhaust gases cause the necessary reaction. 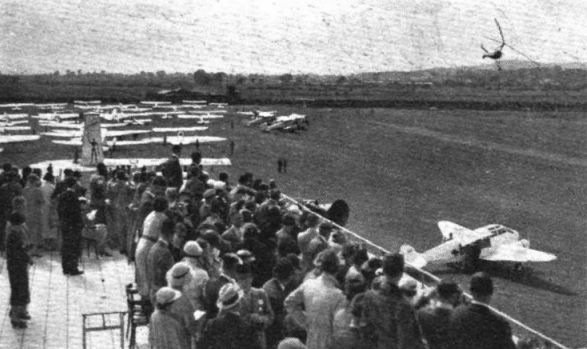 Interest at Ronaldsway after the finish of the London - I.O.M. Race. In the foreground are F/O. 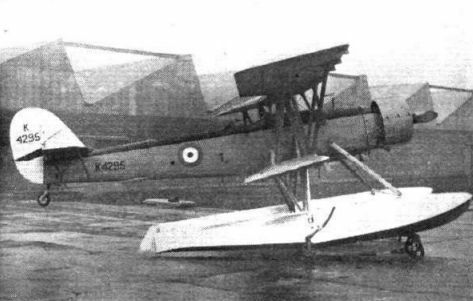 Hughesdon's Wolseley-engined Hawker Tomtit (2nd), Mr. Humble's single-seater Gipsy Six Hawk (3rd) and the D.H.86 flown by Mr. Higgins (4th). The Miles Hawk Six, flown by Mr. Humble, rounds the airport turn in the South Coast Air Trophy race. This machine eventually won at an average speed of 174 m.p.h. Giving them the low-down: This is what the "savages " in the low attack event see during the initial dive of No. 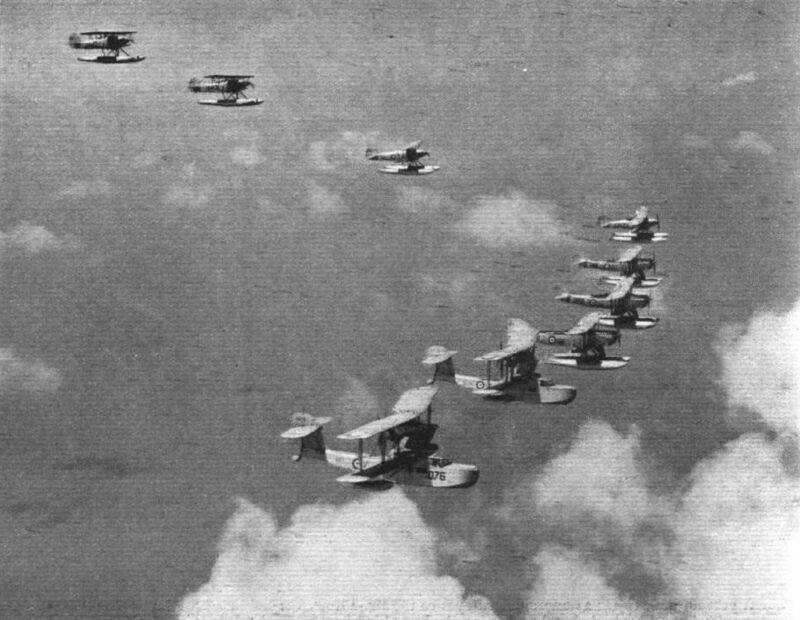 32 (F.) Squadron. But this is nothing compared with what they are shown after the machines break formation and approach the question from every angle. 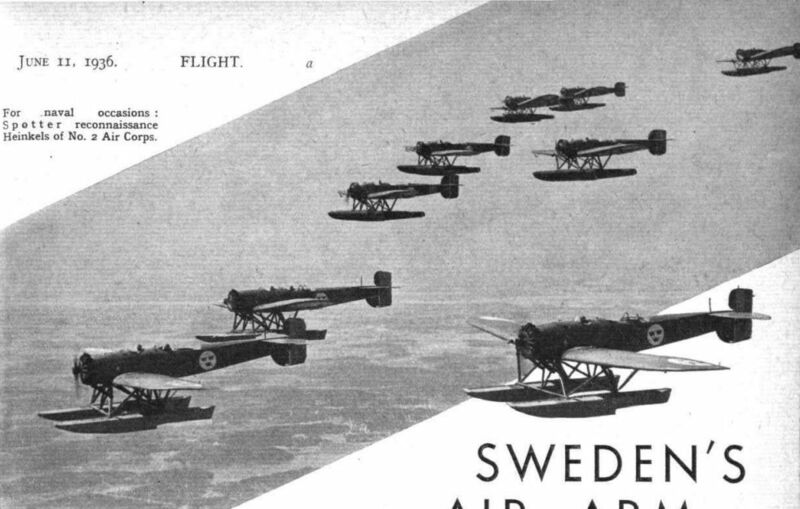 Britain First: Three Bristol Bulldogs and six Swedish Jaktfalks show that Swedish pilots are no mean performers of two very difficult formations, "Echelon stepped up" and "Line astern.'' The Bulldogs are nearest the camera. 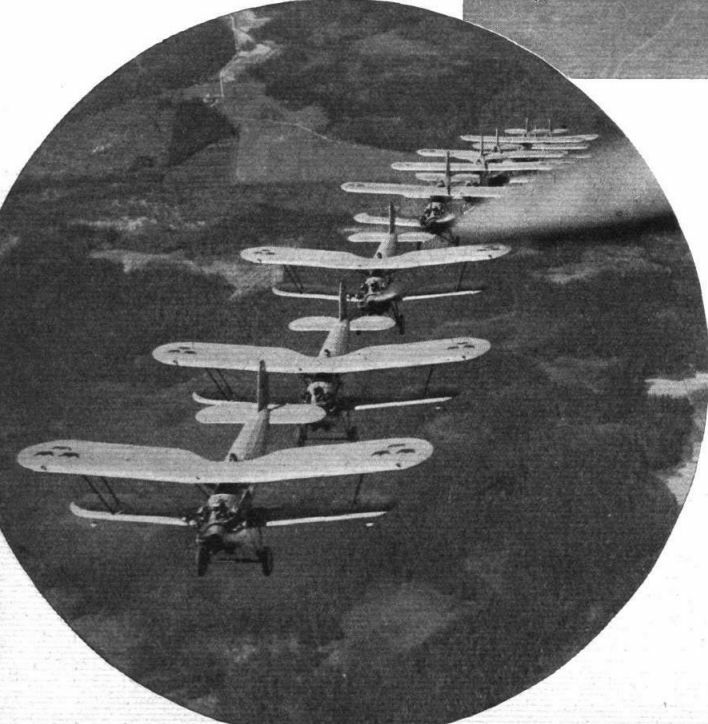 A composite squadron - seen in "line astern" - of three Bristol Bulldogs and six Jaktfalk machines from the Swedish First Air Corps at Vasteras. A.C. - 1936. 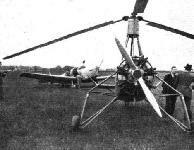 Here is our very latest army co-operation machine - a Westland - with Handley Page slots and flaps. The engine in the prototype is a Bristol Mercury for which controllable cooling is specified. The cabin is heated and the enclosures are easily opened. Performance figures may not be given, but the span and length are, respectively, 50ft. and 30ft. The A39/34 as the machine is known temporarily, will be at Hendon on Saturday. 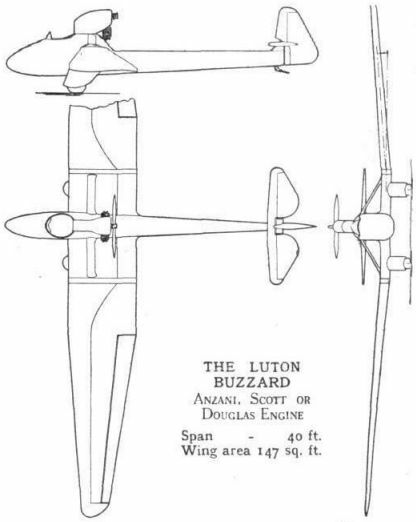 The Boulton Paul Overstrand (two 590 h.p. 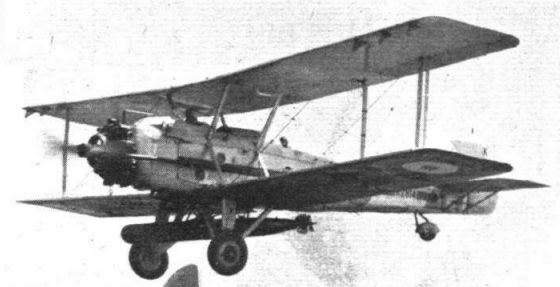 Pegasus IIM), another medium bomber, although of earlier design, which will be seen at the Display in combat with a flight of Furies. OPTIMISTIC NOMENCLATURE. This is what Mr. Gerard P. Herrick, its American inventor, terms a Vertiplane. The upper rotating wing is 20ft. in span and the lower one measures 25ft. The engine is a 125 h.p. Kinner. It seems that the machine has done extensive test-flying. Here, in all the glory of its ''gadgets,'' is the latest single-seater day-and-night fighter to be adopted by the R.A.F. 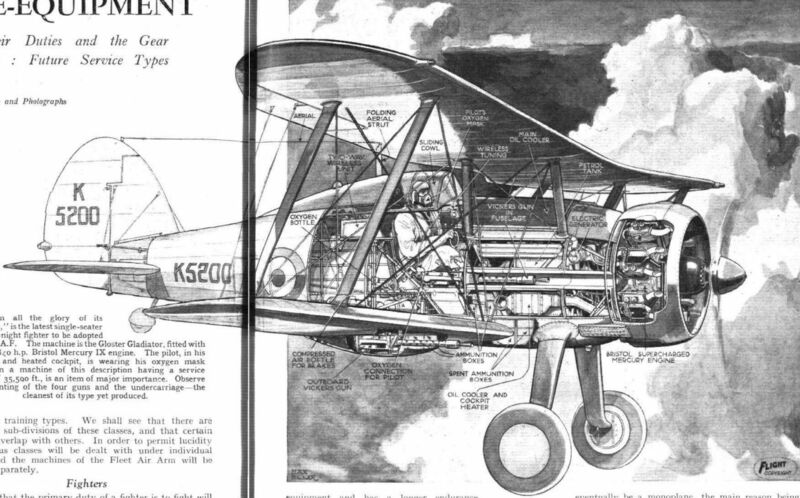 The machine is the Gloster Gladiator, fitted with the 720/840 h.p. Bristol Mercury IX engine. 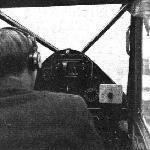 The pilot, in his enclosed and heated cockpit, is wearing his oxygen mask which, in a machine of this description having a service ceiling of 35,500 ft., is an item of major importance. Observe the mounting of the four guns and the undercarriage - the cleanest of its type yet produced. 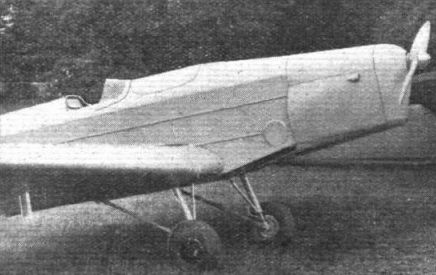 The Hawker Fury is single-seater, an intercepter. The Fury mount the 600 h.p. Rolls-Royce Kestrel. Mr. Lucas brings the first of the new 690 h.p. Hispano-Suiza-engined Spanish Furies close alongside "MR," flown by Mr. Hindmarsh and carrying our photographer. 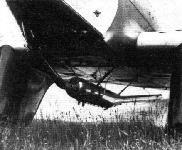 The radiator is further aft along the fuselage than on the Rolls-Royce-engined Furies in the R.A.F. The simplicity of the cantilever undercarriage with its Dowty internally sprung wheels is also apparent. The Wellesley with Bristol Pegasus engine and is of "geodetic" construction. 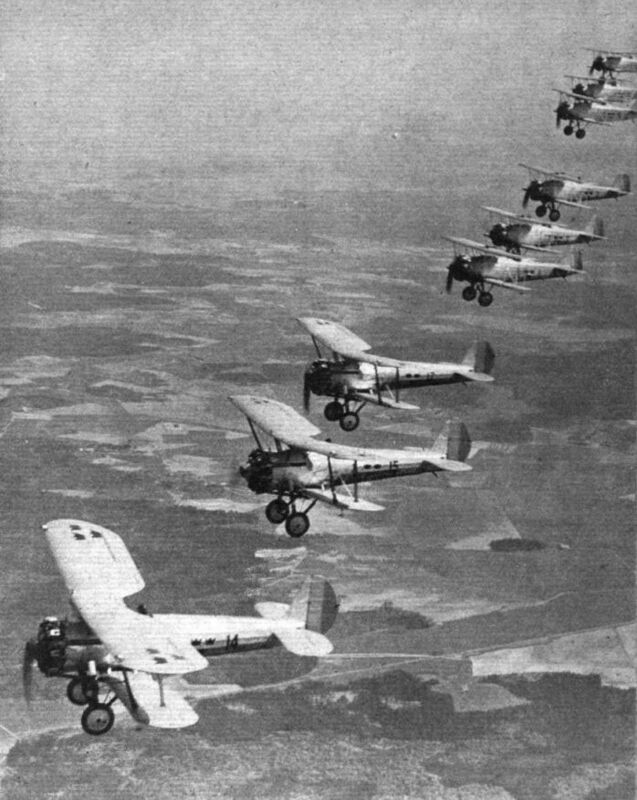 Several Rotas (C.30 autogiros) have been issued to army co-operation squadrons. 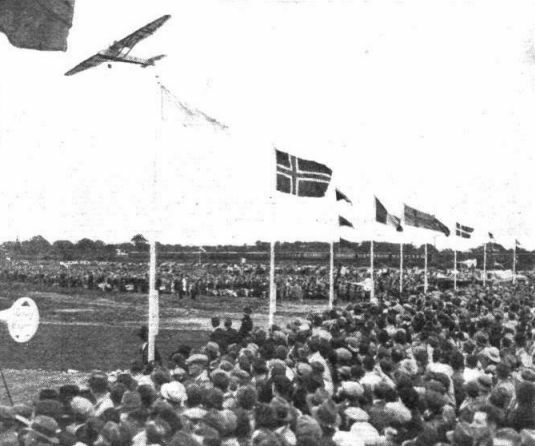 Some idea of the number of visitors and machines can be gathered from these photographs, though only about a third of the visiting machines can be seen. 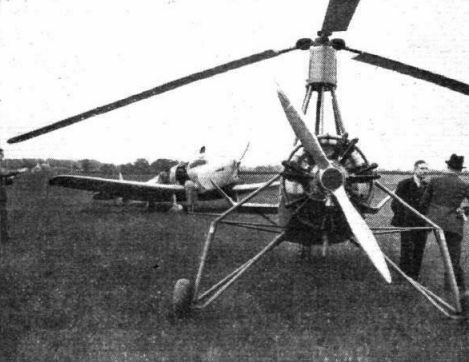 In the left-hand picture the Monospar Ambulance can be seen in the foreground, while Mr. Brie is demonstrating the Autogiro. 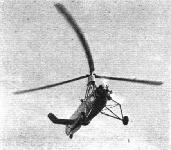 A glimpse of the Miles Whitney Straight under the rotor blades of the C.30 Autogiro. 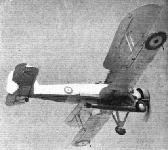 The Gloster Gauntlet is single-seater, being in the day-and-night fighting category. The Gauntlet has the 605 h.p. Bristol Mercury VIS. 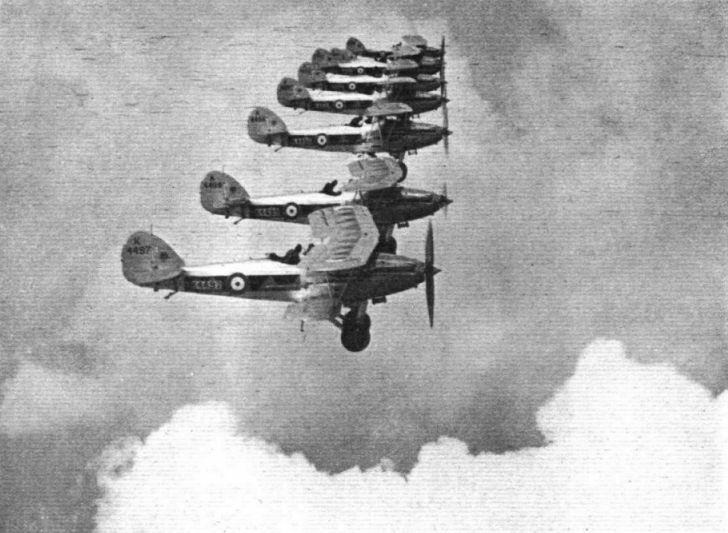 The three Gloster Gauntlets of No. 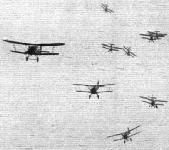 19 Squadron, which put up a magnificent tied-together display. CLOVER IN THE CLOUDS: The trefoil pattern made by the three Gloster Gauntlets of No. 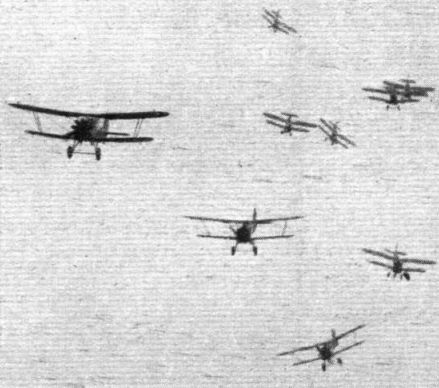 19 (F.) Squadron as they make their almost literally breath-taking manoeuvres in unison at the R.A.F. Display on June 27 will be watched by thousands. 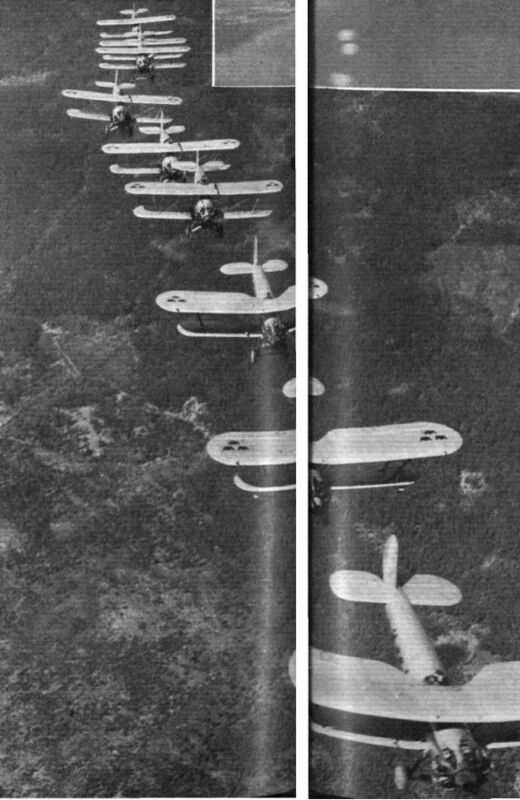 In this Flight photograph - the first aerial picture of this remarkable performance by the Gauntlets - we are shown the linked trio at close quarters. 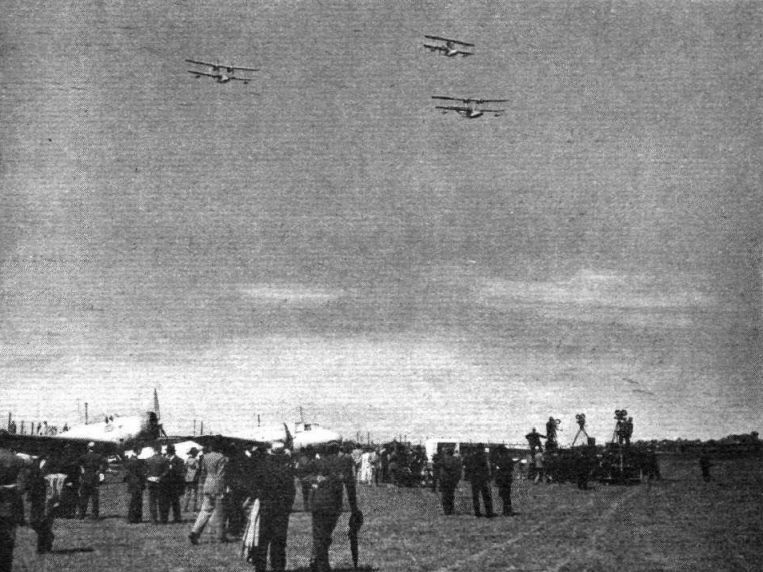 From the ground, spectators see the "flight aerobatics" event, to be given at the R.A.F. Display by Gauntlets of No. 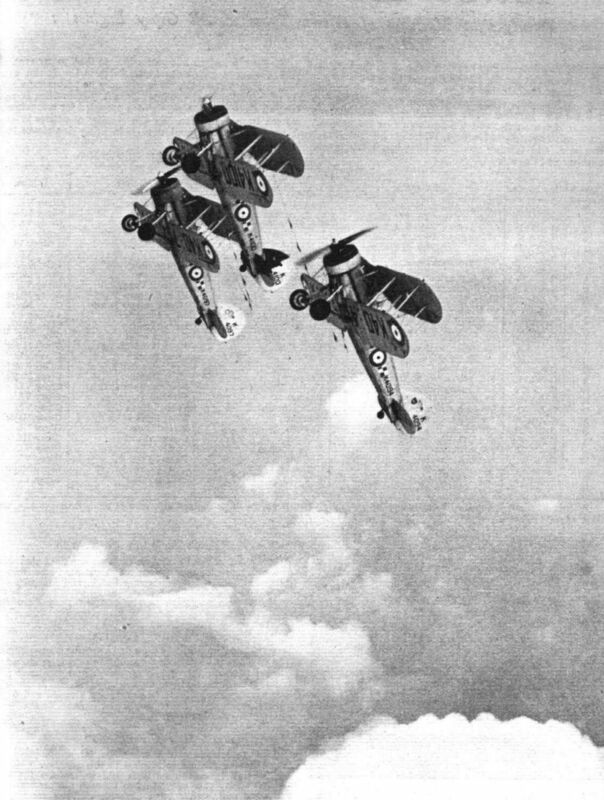 19 (F.) Squadron as an example of perfect team work, entailing seemingly superhuman co-ordination of speed and manoeuvring. From the air, flying near at hand as did Flight's chief photographer when he secured this fine impression of the machines starting a loop, a new angle of appreciation is obtainable. 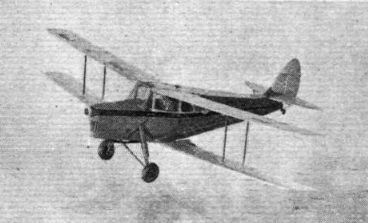 Our standard army co-operation machine: the Hawker Audax with Kestrel IB or X. 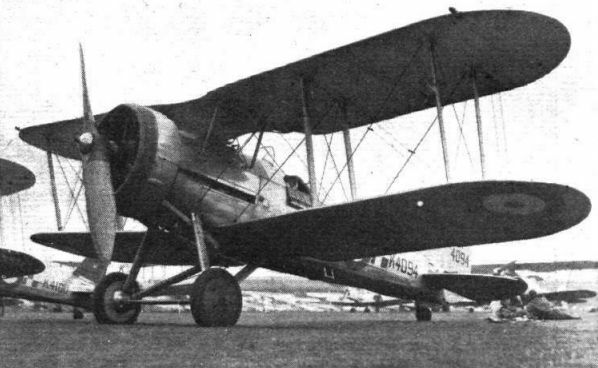 The Hawker Hind light bomber (Kestrel V, 600 h.p.). 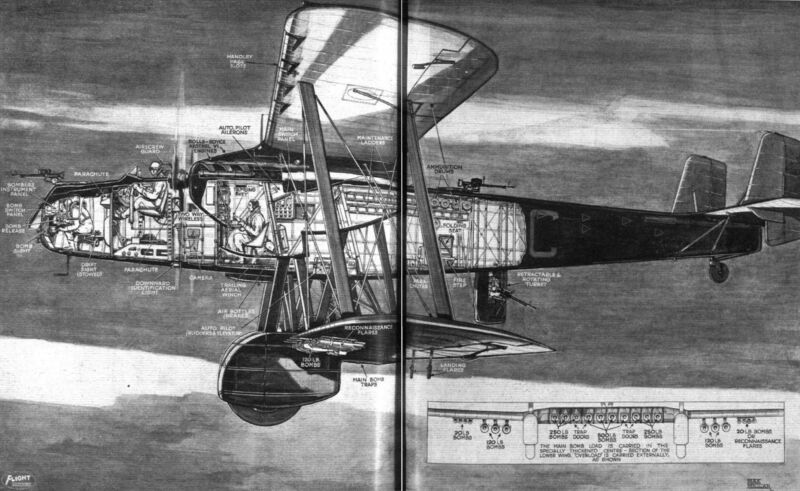 The Hawker Hector is the newest "A.C." machine adopted. The engine is the 725/805 h.p. 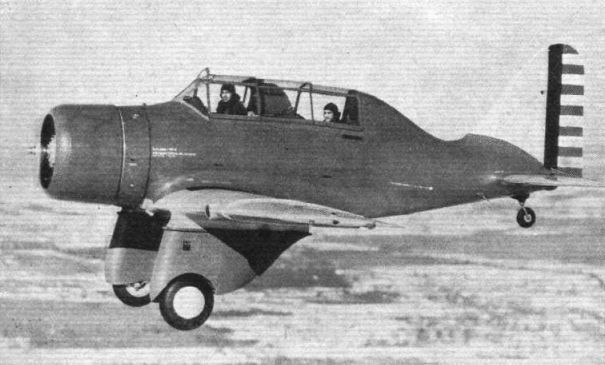 Napier Dagger III. THE SAME - BUT DIFFERENT. 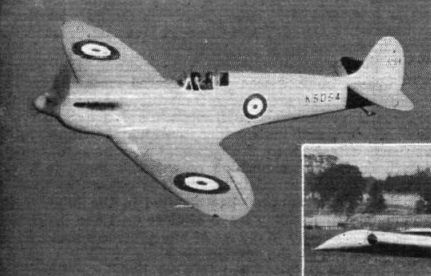 The version of the Blackburn Shark T.S.R. 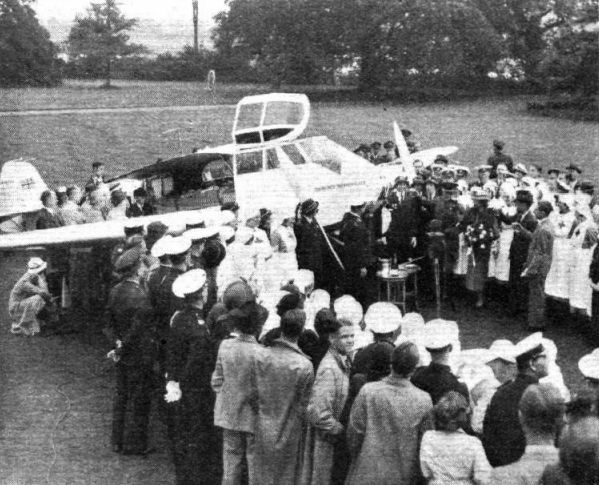 to be flown at the Hatfield Display on Monday, will differ somewhat from that now in service with the Fleet Air Arm. The engine is a 600 h.p. Pegasus III and cockpit enclosures are incorporated - and very neatly too, judging from this photograph. 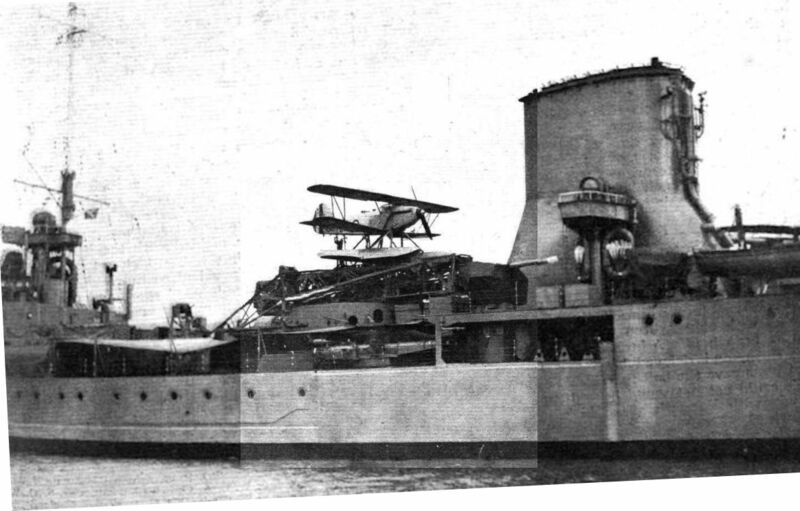 The Blackburn Shark T.S.R. 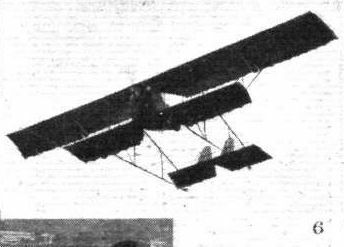 is also shown in its floatplane form. 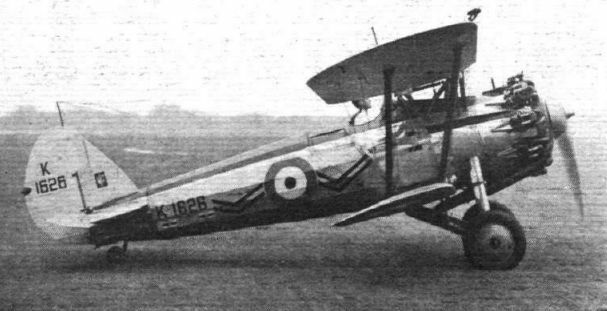 The Fairey Gordon, also a G.P. 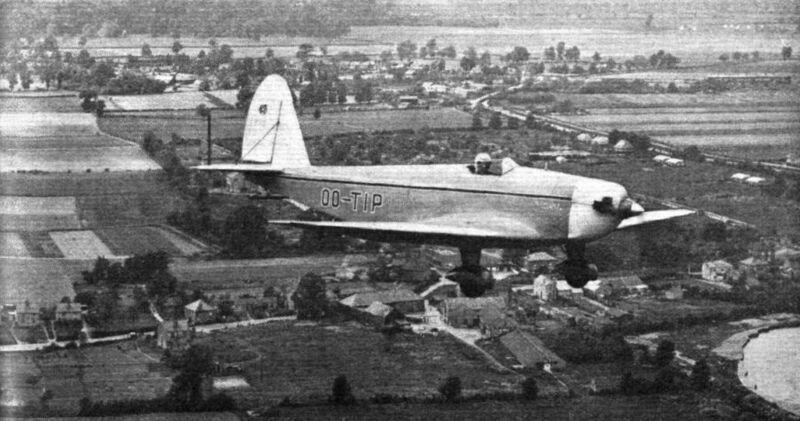 type, with the 535 h.p. 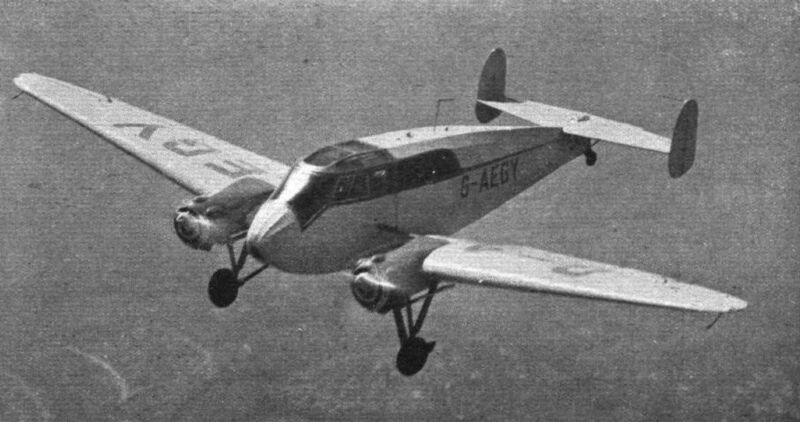 Siddeley Panther IIa. 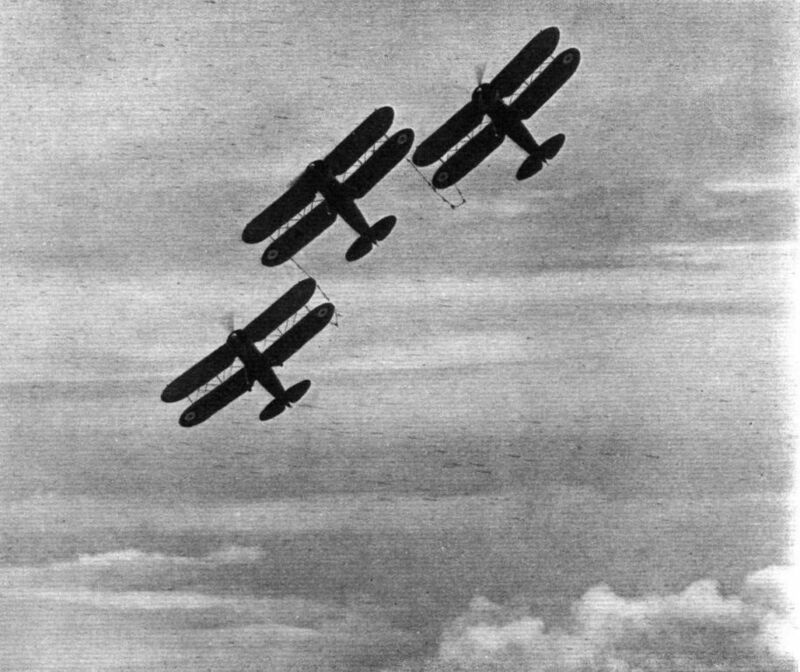 Three Vickers-Supermarine Flying Boats in Formation: In the lead is the Walrus, on the right is the Stranraer, and on the left the Scapa. MEDITERRANEAN MEDLEY. 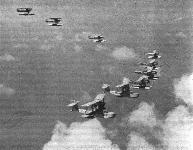 Two Supermarine Seagull Vs, three Fairey III Fs, and four Hawker Ospreys, all catapulted from ships of the Mediterranean Fleet, in the act of assuming a line abreast formation over Alexandria. The official name of the Seagull V, when used by the Fleet Air Arm, is Walrus; the original title for it is retained by Australia. ANOTHER WELCOME MAMMAL: According to the dictionary the walrus is allied to the seals but forms a distinct family. 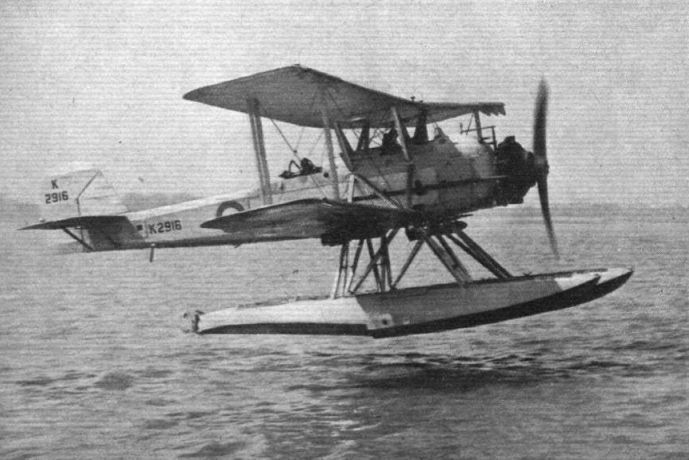 In the Fleet Air Arm the Supermarine Walrus amphibian has been adopted for catapult duty a function hitherto fulfilled largely by the Fairey Seal floatplane. The Hawker Osprey is also widely used. This particular Walrus is shown leaving H.M.A.S. "Sydney" which, like the "Australia" and "Nelson" now carries one of these versatile machines as standard equipment. THE "OSTMARK" IN ACTION: By now the new D.L.H. 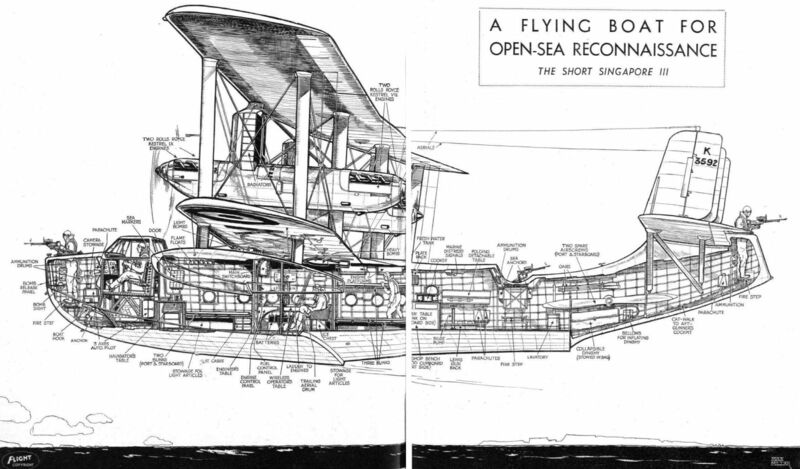 catapult ship Ostmark, some plans for which were detailed in Flight of May 7, should be at Bathurst. During the week-end she made a trial trip in the Gulf of Lubeck. 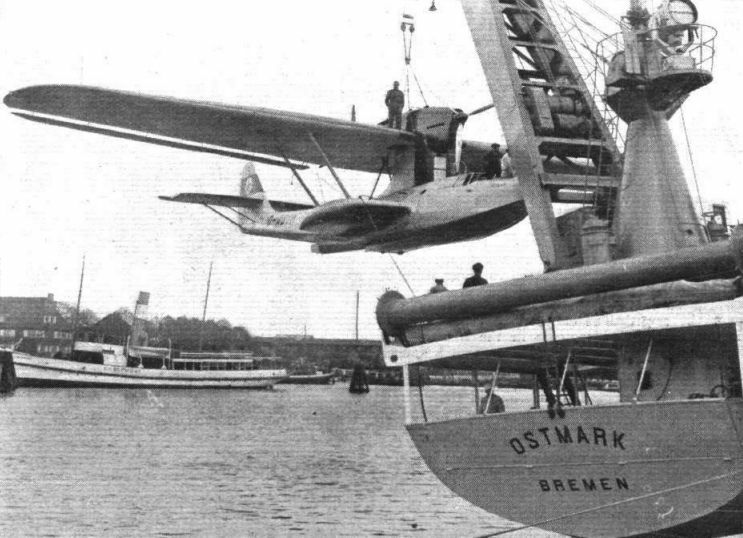 This picture shows a Dornier Do.18 (two 500/560 Junkers Jumo 205 diesels) being hoisted aboard. THE FIRST SYMBOL. The "T" in "T.S.R." stands for "torpedo," "S" and "R" for "spotter" and "reconnaissance" respectively. Within the T.S.R. 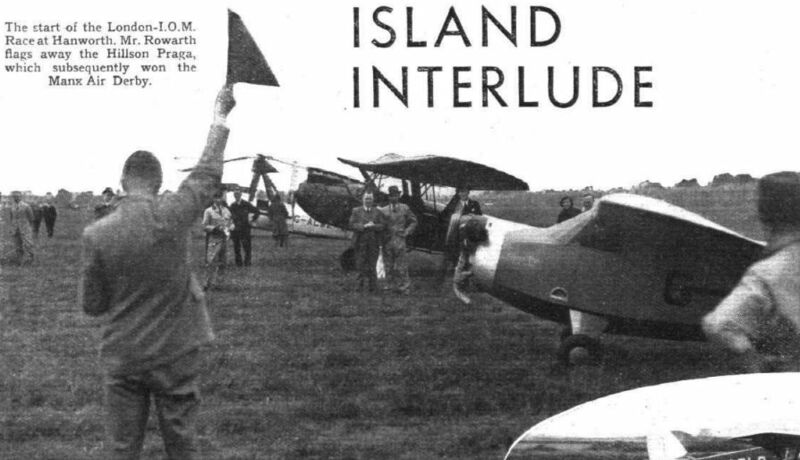 category comes the Fairey Swordfish (Pegasus III) seen here over Martlesham complete with "tin fish." 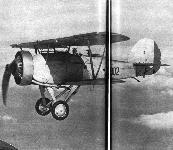 This view of the Fairey Swordfish T.S.R. (690 h.p. Pegasus III) reveals how the torpedo is carried. 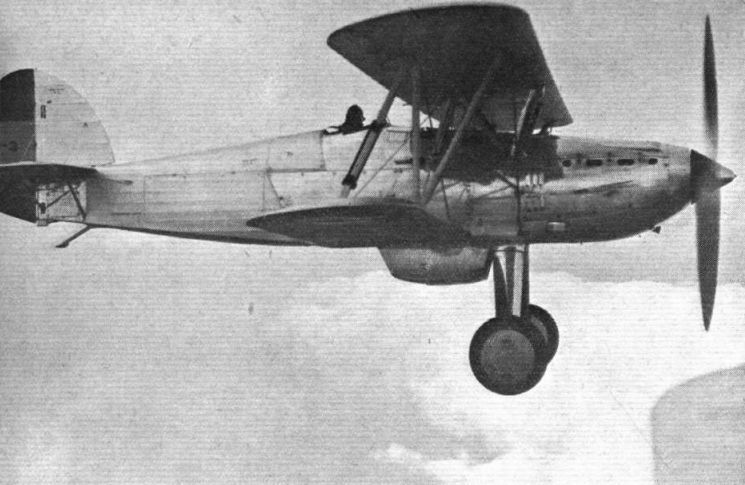 The Vickers Vildebeest torpedo bomber, with 590 h.p. 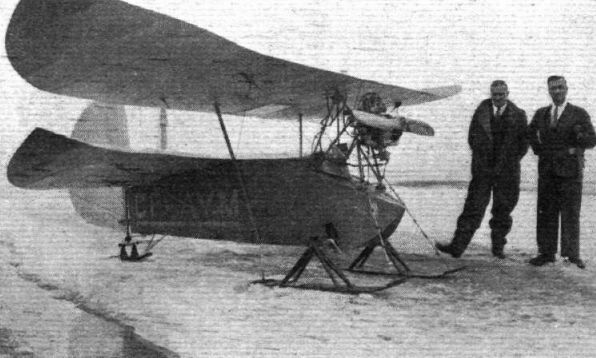 Pegasus II M, is used for coastal defence. 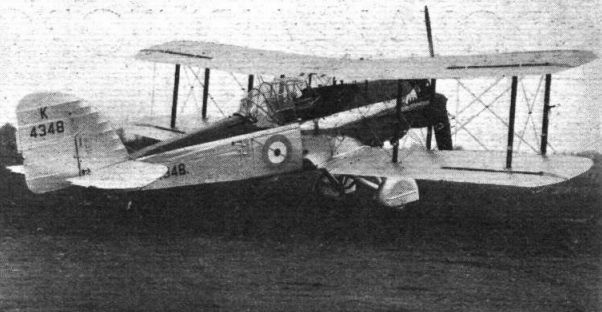 A Vickers Vildebeest floatplane, equipped as a bomber, in the act of touching down at Felixstowe after a test flight. The Bristol 130 bomber-transport has been adopted by the R.A.F. with two Pegasus X engines. 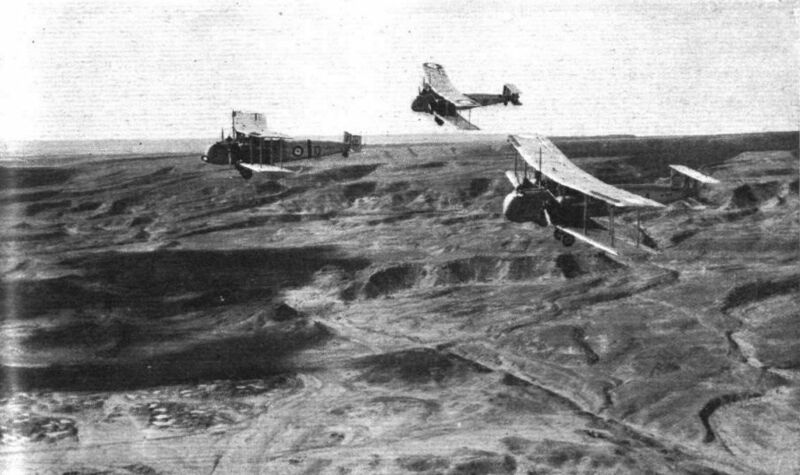 CONVOY: A flight of Vickers Valentia bomber-transports (Pegasus) conveying urgent supplies of machine guns ammunition and stores during the Palestine troubles. By train the 300-mile journey takes fourteen hours. The Valentias do it in three. 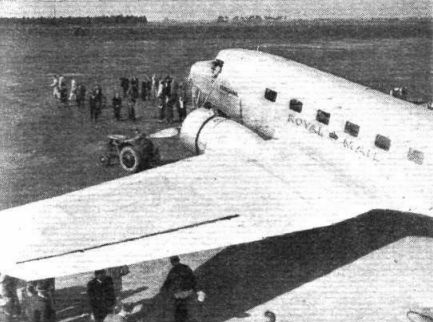 FOR THE BASS STRAIT SERVICE: Holyman's Airways take delivery of their new Douglas D.C.2 after erection at Essendon (Melbourne). For the moment it is flying between Melbourne and Sydney, but it will eventually be put on the Melbourne-Launceston service. SCALED DOWN - BUT NOT IN PERFORMANCE : Fit. 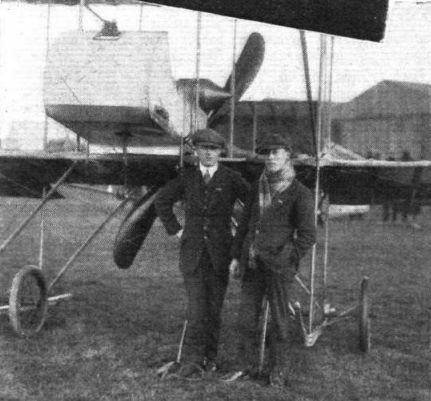 Lt. C. S. Staniland poses with the Tipsy S near the Great West aerodrome. 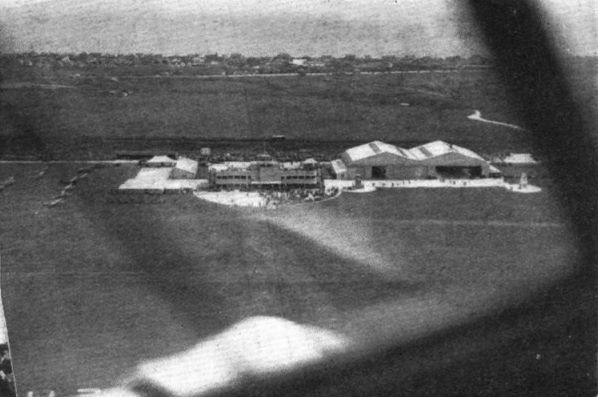 The general appearance of the terminal building with its retractable gangways is well shown in this view. 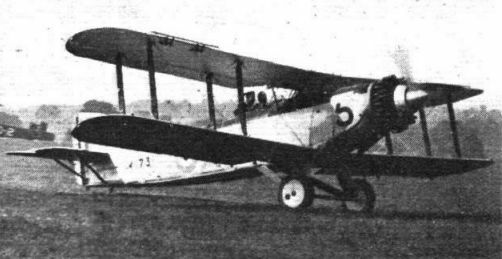 A British Airways' D.H.86 has just come in from Scandinavia. Mrs. Mollison christens the Monospar ambulance for the British Red Cross Society. The S.T.25 in its latest form. The increase in dihedral will be noticed by those who are familiar with the machine. 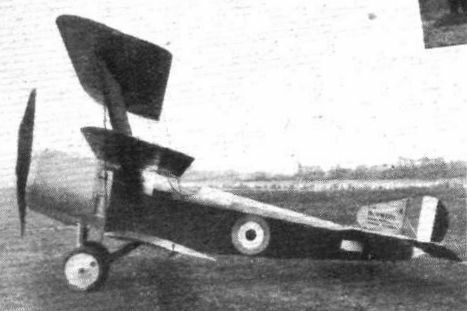 The Hawker Demon is a two-seater fighter. The Demon and Fury mount the 600 h.p. Rolls-Royce Kestrel. 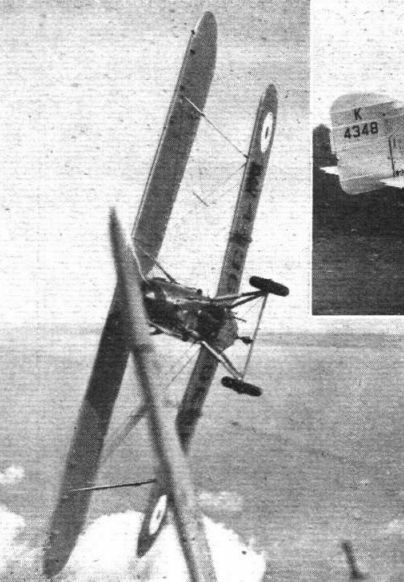 FIENDISH ACCURACY: The Hawker Demon two-seater fighters of No. 604 (County of Middlesex) (fighter) Squadron, under the command of Sqdn. Ldr. 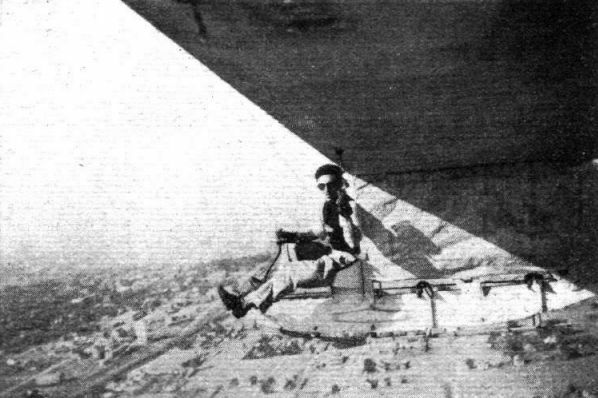 C. P. Gabriel, rehearsing air drill for the R.A.F. Display on June 27. Any inaccuracies - which were conspicuous by their absence - would have been hidden from the permanent audience in the Hendon district by a curtain of clouds which, let us hope, will be completely rung up for the great day. The start of the London - I.O.M. Race at Hanworth. 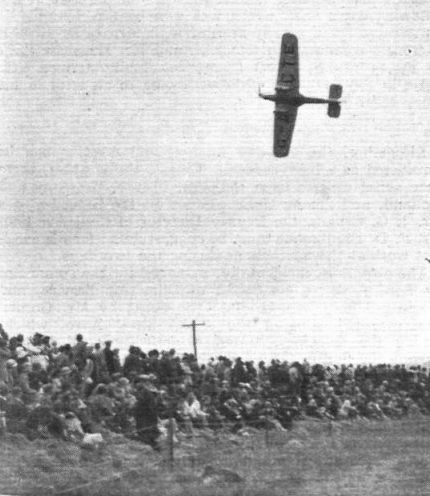 Mr. Rowarth flags away the Hillson Praga, which subsequently won the Manx Air Derby. One of the new 176 m.p.h. 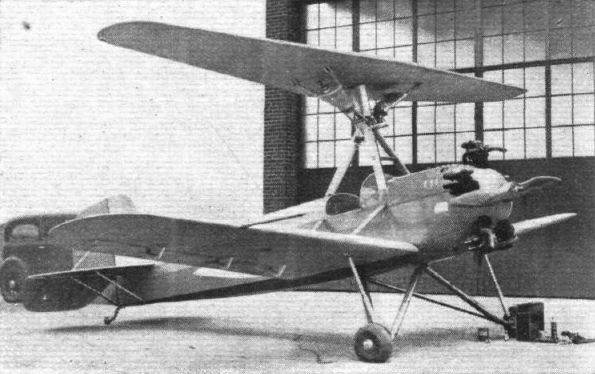 Whirlwind-engined Seversky "basic trainer" monoplanes for the U.S. Army Air Corps. We should know it as an advanced trainer. 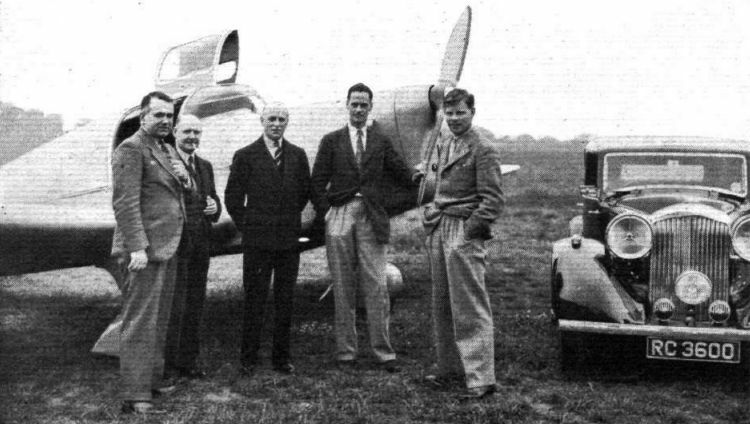 TALKING IT OVER: The recent announcement of a working arrangement between Phillips and Powis Aircraft Ltd., and Rolls-Royce Ltd., lends interest to this photograph of a group at Reading last week. From left to right are Mr. Hives, Mr. Ellor and Lt. Col. Darby of R.R. and Mr. C. Powis and Mr. F. G. Miles of P. and P. The other "personalities" are a Miles Whitney Straight and a Bentley. Mr. 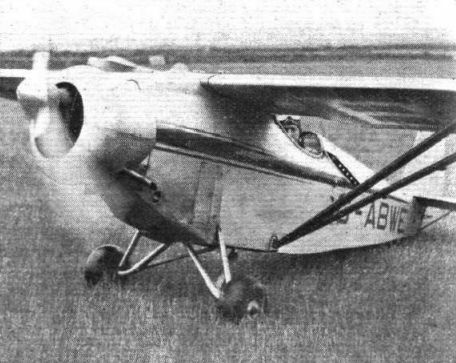 Beard, the pilot of the interesting little American machine, the Taylor Cub, which was virtually a non-starter owing to carburation difficulties. The opening action at the side is noteworthy. The interior of the Lorenz-equipped D.H. Puss Moth on which the tests were made. It will be noticed that the instrument is of the original type. 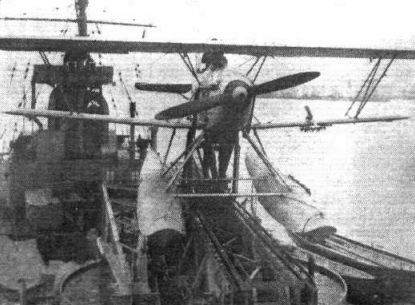 The Hawker Osprey fleet fighter reconnaissance machine as a seaplane on a cruiser's catapult. 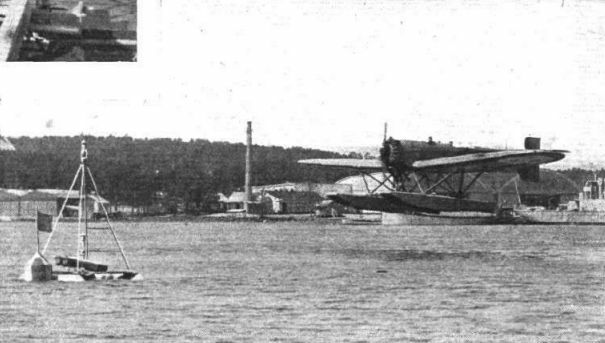 Floatplanes are used for catapulting off cruisers and capital ships. This Flight photograph shows a two-seater fighter-reconnaissance Osprey stowed on its catapult on board H.M.S. 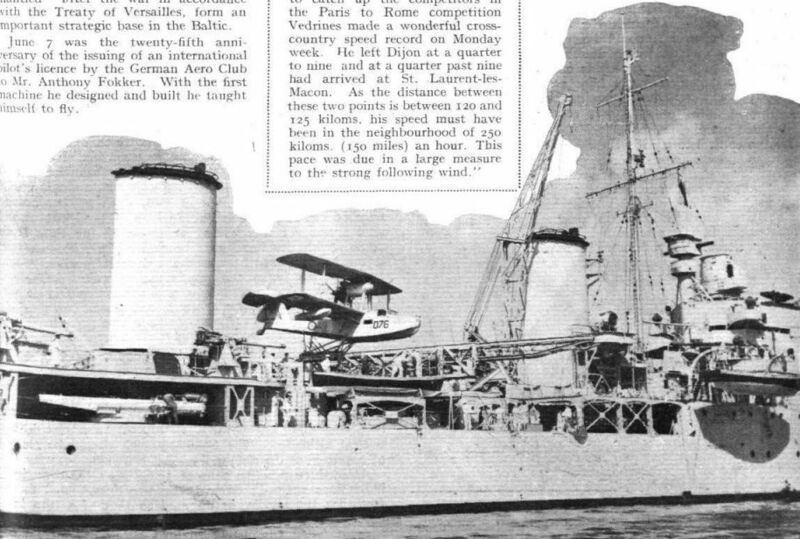 Leander, a 7,000-ton cruiser. Hawker Ospreys reposing on the after deck of H.M.S. Gotland, the Swedish navy's aircraft carrier. The catapult is said to be capable of getting eight machines in the air in five minutes. The system of tracks leading to the catapult is visible. In the foreground are rails for the reception of the empty trolleys. The catapult is of German manufacture and is operated by compressed air. The ancient Caudron. Everything is sartorially in keeping save the telephone tubes, which were not used in 1912. The B.L.G. undercarriage in action on an Avro Avian. 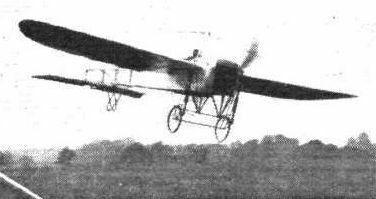 Above is seen a take-off, showing the front wheels off the ground. On the left is a landing. The pilot was Mr. R. L. Palmer, of the Hanworth School, who has done the testing and is doing the demonstrations of the undercarriage. The elevator is in the neutral position in both cases. 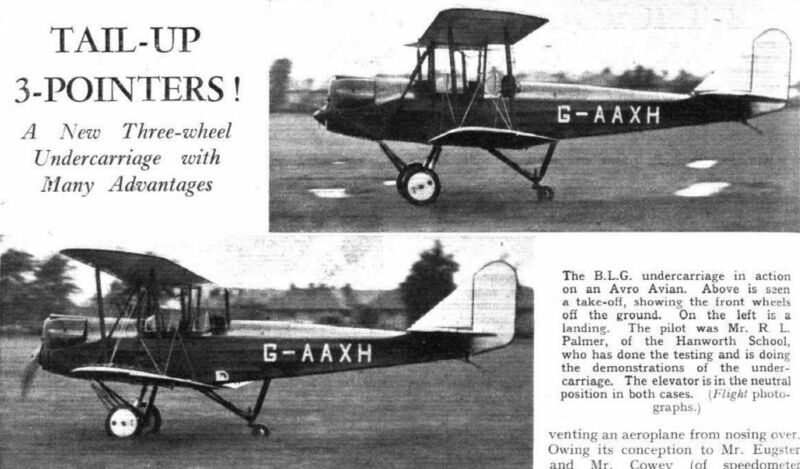 The experimental model of the B.L.G. undercarriage on the Avian. On the left are seen the three wheels, with the rear strut extended. On the right, the rear strut is telescoped. Note the long stroke. The rear strut operates an over-riding device which releases the front wheel brakes as soon as the rear wheel leaves the ground. 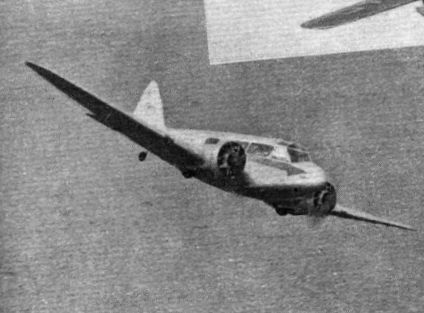 The machine is the Bristol 142 monoplane, which may be regarded as the precursor of the Blenheim medium bomber to be seen in the new-types park. 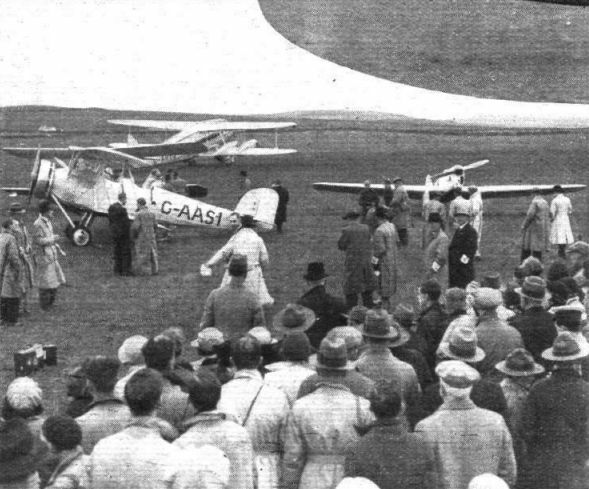 Mr. A. Henshaw's winning Leopard Moth (Gipsy Major) arrives at Ronaldsway, having averaged 126.75 m.p.h. Mr. Lowe's Comper Swift has been improved in appearance by the fitting of an N.A.C.A. type of cowling designed and made by Mr. Cross, of Romford. 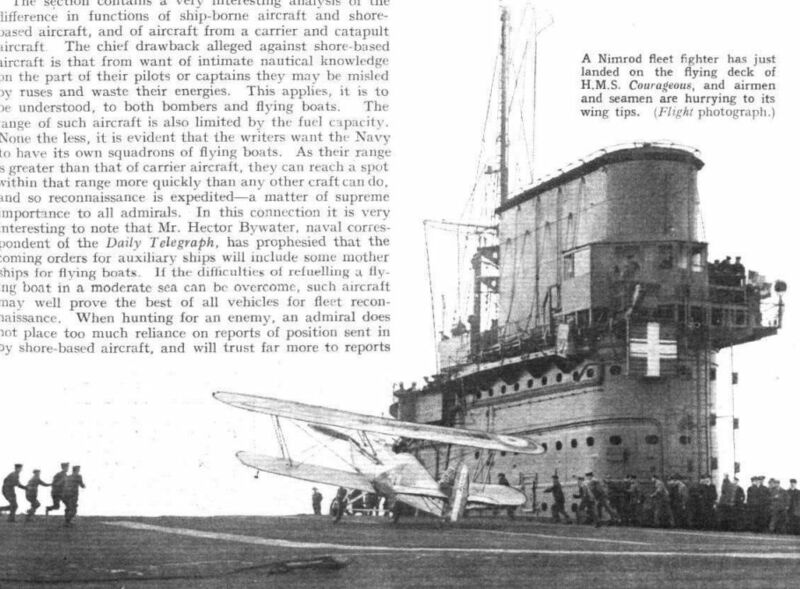 A Nimrod fleet fighter has just landed on the flying deck of H.M. Aircraft Carrier Courageous, and airmen and seamen are hurrying to its wing tips. 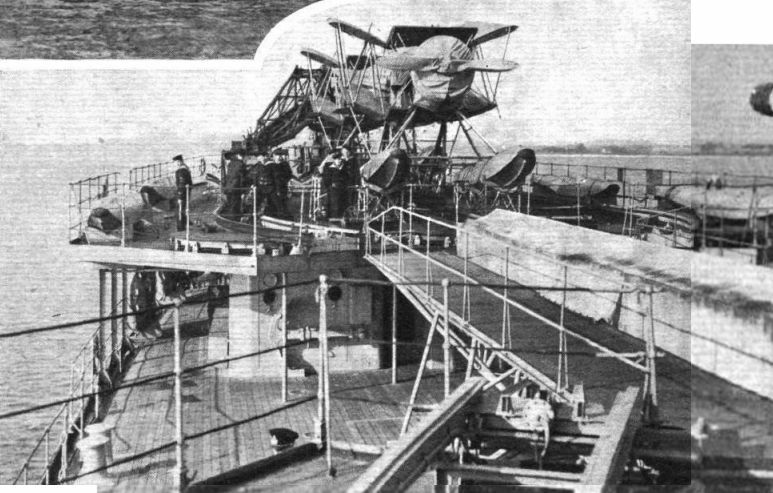 The bridge and funnels and other top-hamper are all contained in the structure on one side of the deck. 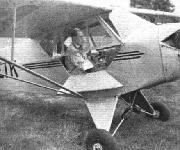 A FLEA ON SKATES: Built by an aircraft engineer to the order of a Montreal private owner, this Pou has performed well. The mysterious erection on the tail is actually the St. Hubert airport airship mooring mast, in the background. POU FOR TWO. 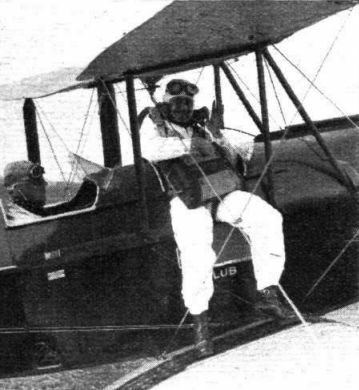 This photograph, reproduced by courtesy of Les Ailes, shows a new two-seater cabin version of the Pou-du-Ciel which has been built by M. Henri Mignet. The engine is a 45 h.p. 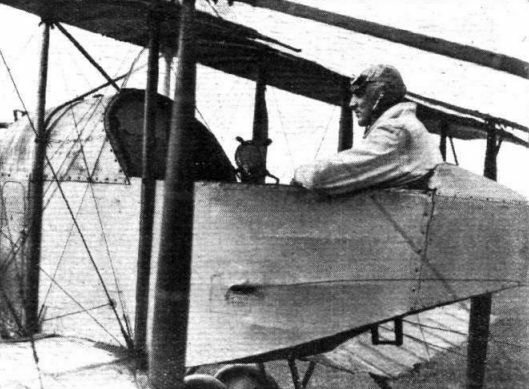 Salmson. 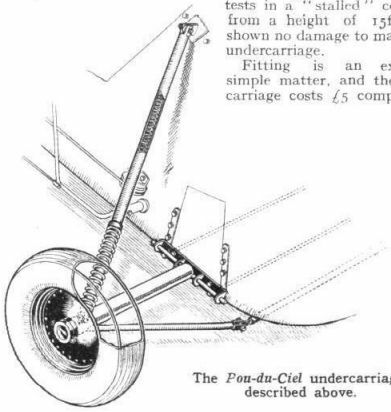 The Pou-du-Ciel undercarriage described above. For naval occasions: Spotter reconnaissance Heinkels of No. 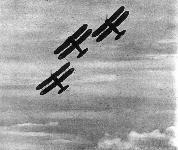 2 Air Corps. 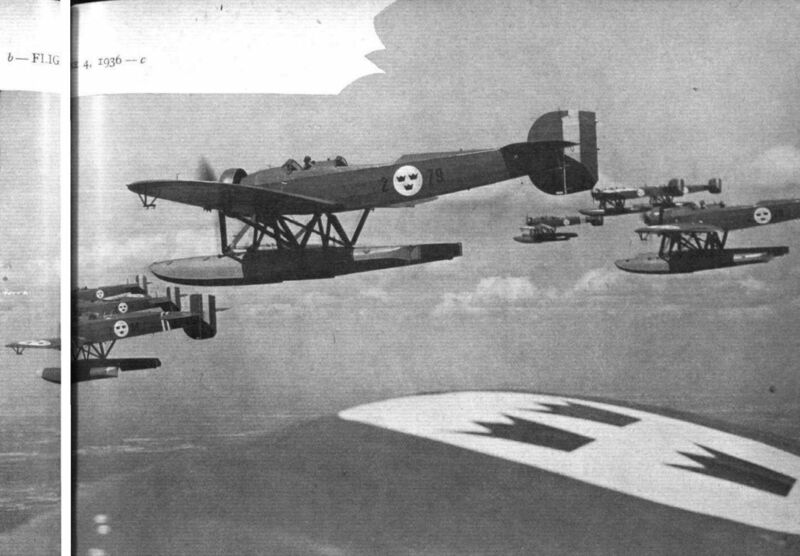 The sign of the triple crown: Bristol-engined Heinkel S5C and S5A floatplanes of the Second Air Corps, Royal Swedish Air Force, over Hagernas. 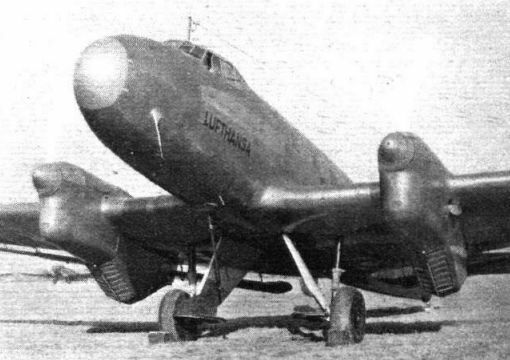 Night-flying aids: A Bristol-engined Heinkel of No. 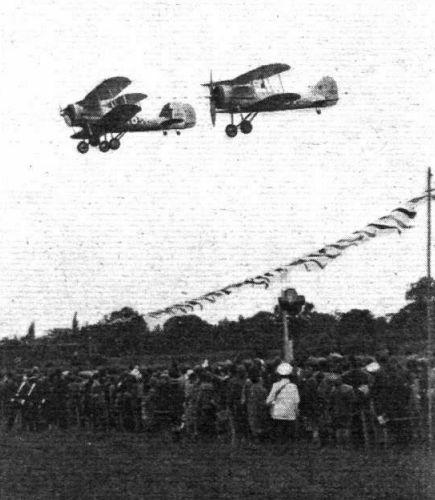 2 Air Corps landing alongside one of the flare floats. The two dissolved acetylene containers can be seen just above water level. 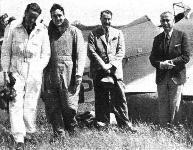 Pilots and officers at Hagernas (left to right): Sub. Lt. Nylander, Ft. Lt. Weidling, Ft. Lt. Wennsrstrom, Sqn. Ldr. Hard, Group Capt. H. Enell, Ft. Lt. Lennquist, Ft. Lt. Falk, Sub. Lt. Anderson and Sergeant Major Bareutheim. The enclosures were decorated with the flags of all nations whose countries are linked to our own by the routes of British Airways Ltd. In the air is Mr. Kronfeld's Drone. A Miles Nighthawk training aircraft will be among the "new and experimental" types. The 130 h.p. Gipsy Major and 200 h.p. Gipsy Six are alternative power plants. Spectators at Hanworth on Saturday obtained the first public view of the Cirrus Minor-engined B.A. Swallow which has been undergoing tests at Brough. 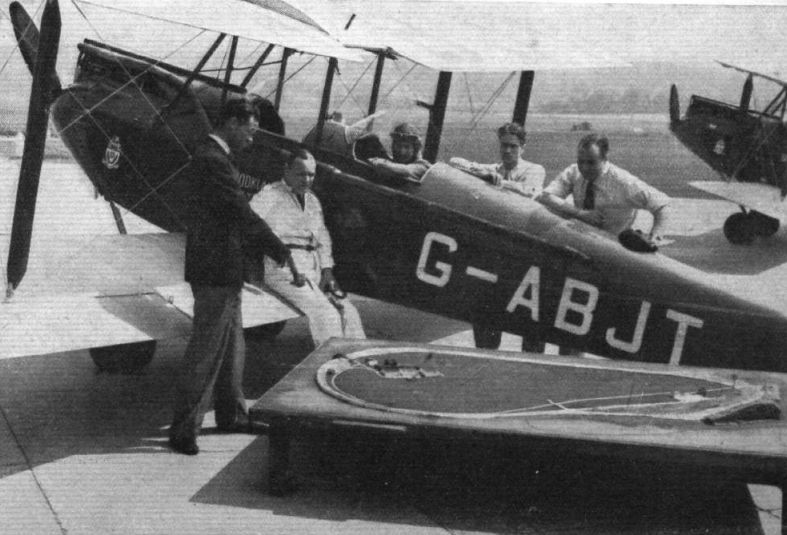 Mr. E. H. Alliot, a Brooklands instructor, demonstrating to pupils with a model of the aerodrome he has built to indicate the best directions for taking off and landing. 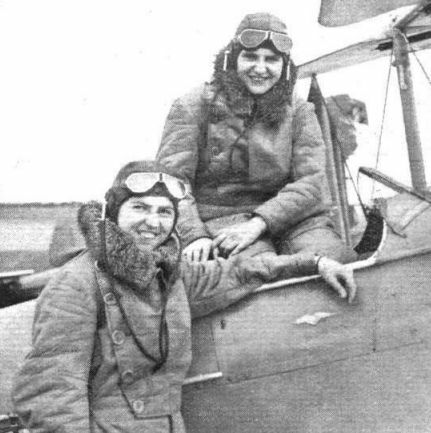 The only lady competitors, Miss Mabel and Miss Sheila Glass - the former in the cockpit of their Gipsy Moth. 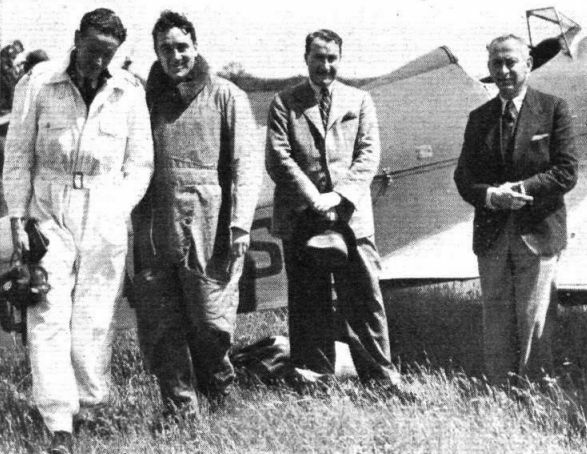 With very small flying experience they managed to get through to the Isle of Man in weather which occasionally frightened the most hard-boiled of pilots. 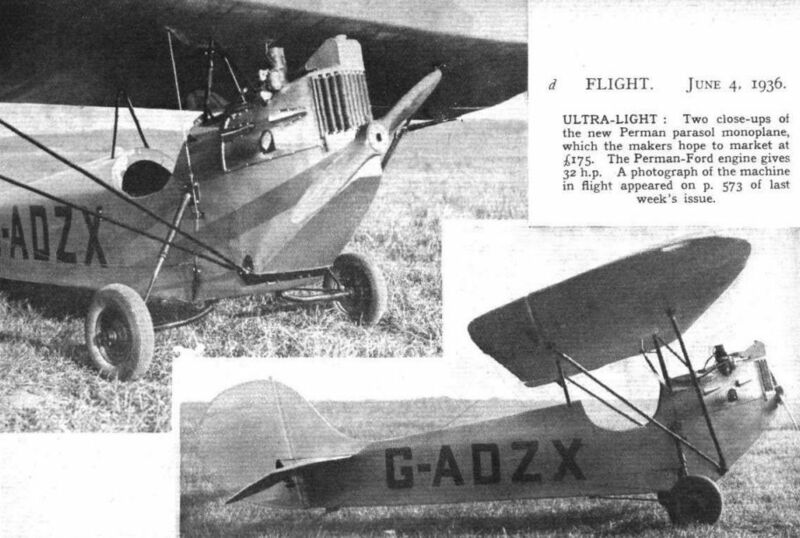 ULTRA-LIGHT: Two close-ups of the new Perman parasol monoplane, which the makers hope to market at ?175. The Perman-Ford engine gives 32 h.p. INTELLIGENT ANTICIPATION? 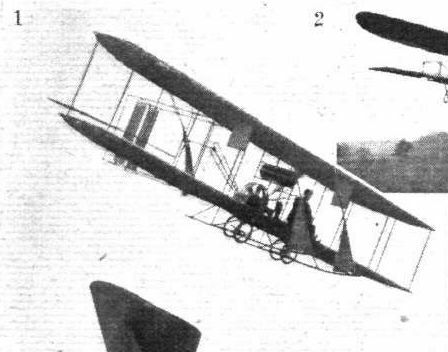 Bearing an odd resemblance, at least as far as the hull design is concerned, to the new Empire flying boats, this "flying machine of the future" was visualised in 1907 by Mr. George L. O. Davidson, of Colorado and Scotland, who (according to the original prospectus, sent by a reader) floated a company for aircraft manufacture in that year. His forecast was "weight, 100 tons; speed, Chicago to New York in 3 hours; capacity, 100 passengers at, say, 10 dollars each per journey." 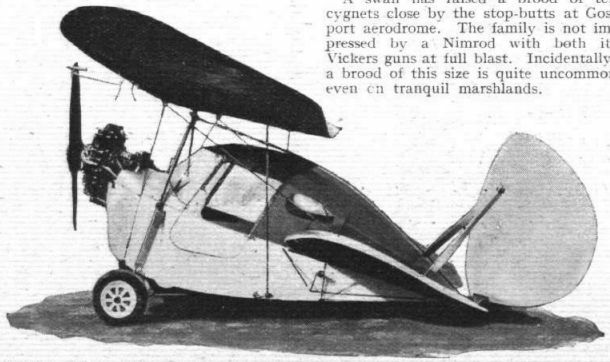 The Vickers P.V. 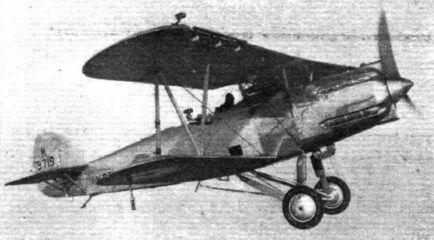 fighter with Bristol Aquila sleeve valve engine.